It is not hyperbole to state that all of us - our behaviors; buying decisions; and, ultimately, our thoughts - are constantly informed by a cascade of clever algorithms that have learned our patterns. 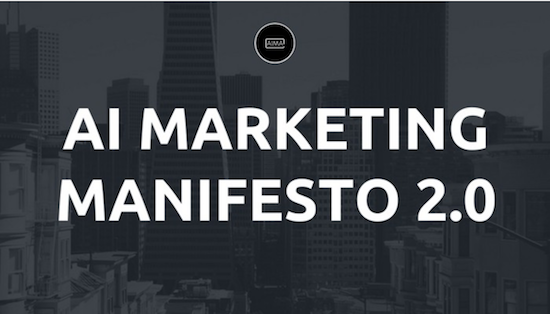 It is an absolute certainty that those of us leading marketing will continue to work diligently to apply machine-learning algorithms to the myriad of real-world items listed in Federico's Artificial Intelligence Marketing Manifesto one year ago. These items included Predictive Customer Service, Dynamic Product Pricing, Forecasting, and sophisticated Image, Voice, and Language recognition algorithms. Federico, who founded the Artificial Intelligence Marketing Association (AIMA) just one year ago (January 2017), has seen the San Francisco chapter expand. This chapter attracted thousands of local followers and magnetized AI marketers (over 270 in the bay area) across borders. This chapter has grown to the point that we have attracted three international conferences: The AI Congress, Business of Bots, and AI Expo. Frederico will speak at the upcoming AI Congress in Las Vegas in early May, presenting "The State of AI Marketing." He will also be at the Business of Bots conference in San Francisco. In addition, AIMA San Francisco will be rolling out a series of meetups in San Francisco on the intersection of advertising and artificial intelligence. Data , which, at best, is costly . In fact, data is so costly that both Fortune and The Economist have declared "data is the new oil." Beyond the ever-increasing high cost of data, it is also notoriously flawed. Analysis, to ensure the data is properly interpreted. Machine learning, which is believed to be a solution but still an obstacle. Machine learning can create new, smarter algorithms based on existing datasets to deliver actionable, revenue-producing insights . These insights include things like micro and macro consumer predictions that pinpoint what advertisers and marketers should message out next. Every marketer knows the obstacle to good data. If you have the massive reach of say, Coca-Cola, then you have the budget and data to deliver predictions and bullseye marketing messages to discrete target audiences. But if you are an advertising or marketing professional within a smaller agency, you and your teams are beset with this first massive obstacle. Let us face it; the financial distraction of data-buying eats into team focus and profits. The same goes for analysis. Every advertiser knows there is a reason why data scientists and data analysts are the hottest jobs right now. The stumbling blocks this massive data talent shortage presents to advertisers and marketers depend on data-gathering and interpretation. Finally, there is machine learning. It is worth noting that machine learning can function as both a solution and an obstacle. The reason for this double-function is because buying, testing, and applying the right algorithms to accomplish advertisers' ever-pressing need for insights is costly and time-consuming. But the machine is also the solution that the advertiser can rely on to ensure their messaging remains custom, compelling, and intelligent when the technology is available and easy to use. But Thanks to Blockchain Innovators, These Three Main Obstacles Are Rapidly Disappearing. Here is What is Next. Several AI companies are at the forefront of removing these obstacles — or, to use a Silicon Valley term , "disrupt" these hurdles to the point that by end of this year we expect this Terrible Trio (data, analysis, and machine learning) to all but disappear. Companies like Synapse AI and RepuX have been hard at work creating new platforms and new ways of making data cheaper, interpreting datasets in the right way and making machine-learning algorithms accessible to everyone—for example, to future AI-empowered marketers. According to Dr. Ben Goertzel, founder of Zurich-based SingularityNET—a decentralized marketplace that allows AI algorithms to cooperate and coordinate—"When data is more accessible, marketers can create, monetize, and use AI at scale." Copyright 2018 SingularityNET.io— "The Decentralized Marketplace for AI"
Dan Gailey, CEO of Synapse AI (currently headed into ~$7M ICO), is set to empower advertisers and marketers to do just that. 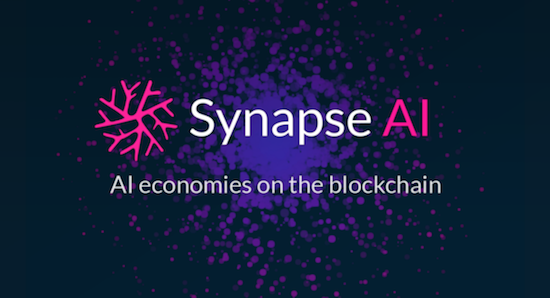 Copyright 2018 Blog.synapse.ai — "AI Economies on the Blockchain"
Gailey is creating an entirely free, open AI ecosystem that functions as the Wikipedia of AI algorithms. Gailey envisions a wide-open repository containing fresh data and new algorithms based on innovative machine-learning tools through which marketers (and anyone, really) can readily gain the insights they need by simply creating a free account. "The future will be built on a fair and balanced intelligence available to all equally by using newly-created AI economies that any agent can participate in and receive some reward for doing so," Gailey said in a February announcement about the Synapse AI public token sale. Adding to the decentralized data disruption is RepuX, an ecosystem for small and medium-sized enterprises (SMEs) that will enable them to monetize their data by selling it to third-party developers. Developers will then create new applications based on SME data and then offer their applications for sale on the RepuX platform. The net-net is that the data cost and availability obstacles, which are currently the biggest obstacles, will diminish or evaporate. The net-net is empowering marketers to more readily and inexpensively deliver predictive analytics services to improve SME business processes. "The monetization opportunities for SMEs and developers are huge. At this point in time, data service providers like AliBaba, Salesforce, and Google represent $4 trillion worth of services," according to David Siu, a RepuX spokesperson. What will the elimination of the three major AI barriers mean for marketing professionals? What will it mean when data and machine learning tools are free and ready to access as easily as logging into Gmail each day? What will it mean for marketers on the front lines to have readily-consumable answers at their fingertips? Will we be able to log into a free repository where a simple search turns up fresh data and applicable answers? Put yourself in the shoes of a frontline marketing professional at a small or medium-sized business. Your CEO tasks you with delivering predictions for Q3 advertising messages based on data gathered in Q1 and Q2. Prior to the intersection of data sharing and blockchain, this task would typically have represented a cost —a cost of gathering the data or of purchasing third-party software to interpret the data—to arrive at the critical insights required. Now—with the advent of new AI innovations like Synapse AI, RepuX, and others—the cycles of accurate predictive planning will be unfettered. How Will This Change Impact the Future of Big Data Providers Who Currently Make Millions in Revenue by Selling Customer Information? We at AIMA predict this change will do to the big data sellers — and perhaps to data analysts - what Google did to Encyclopedia Britannica salesmen and map sellers. Soon, marketing departments — and not just them — of SMEs will be able to implement big data providers' information shared on the new blockchain infrastructures. They will also be able to access AI drag-and-drop algorithms (AI for Dummies) on top of their current marketing stack. They will gain fully AI-empowered marketing heroes —and perhaps without the need of data analysts. We will see.